• University of Guadalajara - with several units in the region of Jalisco with more than two centuries of tradition and represented by Miguel Ángel Navarro Navarro, Rector General University of Guadalajara. • Inter-American University Organization (OUI IOHE), an organization with a strong presence in the higher education community of the Americas and the College of the Americas (COLAM) - that develop and offer training programs with an inter-American, interdisciplinary and intercultural perspective. 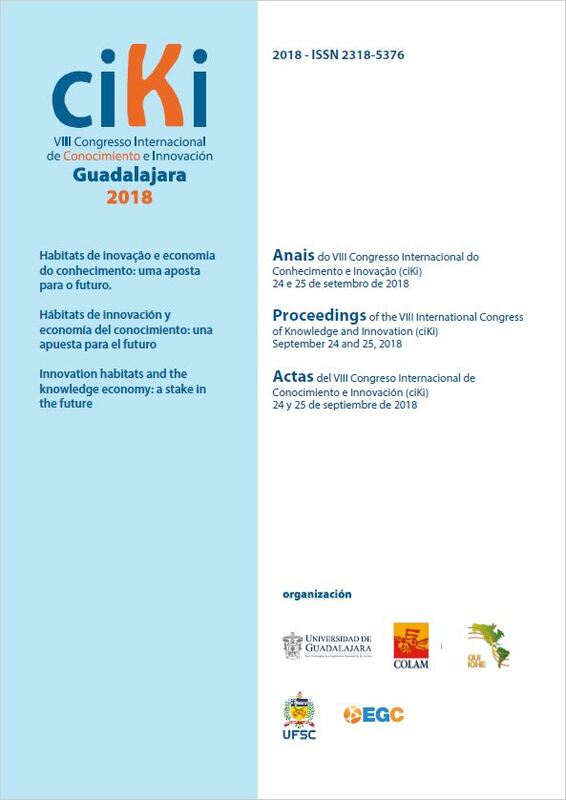 It is the eighth edition of the ciKi, with the central theme of "Habitats of innovation and the knowledge economy". Receiving hundreds of articles submitted, 128 of these articles were selected through blind-review. We thank the authors and reviewers and introduce the community to the selected articles. ORGANIZATIONAL STRATEGY AND INNOVATION: A CASE STUDY IN A DISTRIBUTION AND LOGISTICS COMPANY. INDUSTRIAL BIOTECHNOLOGICAL LABORATORY ADJUSTABLE MOBILE AND SCALE OF THE MODEL OF BIOFABRICS. PHYTOLAB. The International Congress of Knowledge and Innovation - Ciki seeks to promote the conceptual, methodological and practical development of Knowledge Management, Intellectual Capital and Innovation Management. The event is an initiative of the postgraduate program in Engineering and Knowledge Management of the Federal University of Santa Catarina (UFSC), the Scientific and Technological Park (TECNOPUC) of the Pontifical Catholic University of Rio Grande do Sul (PUCRS) and the Program College of the Americas (COLAM) of the Inter-American University Organization (IOHE), in partnership with several educational institutions and organizations in Latin America. It is a technical-scientific space in which researchers, decision makers, managers and professionals can collaborate, debate, develop or share theories, methodologies, tools and experiences in these fields. Throughout its history, Ciki has consolidated itself as a space for the exchange of ideas, experiences and trends relevant to the management of knowledge and management of innovation, in the public sector, in the private and academic sectors.